The 2nd TROLLEY city-industry-summit entitled "New Trolleybus Designs & Innovative Trolleybus Marketing" took place on 22 October 2012 in Leipzig in the framework of the new mobility fair 2012.The topics of the presentations ranged from the importance of new bus designs for trolleybus promotion to the potential of social media applications for trolleybus marketing and the relevance of strategic marketing and communication activities for the introduction of new trolleybus systems, using the example of the City of Leeds in the UK. Please, find the presentations as pdf downloads below. 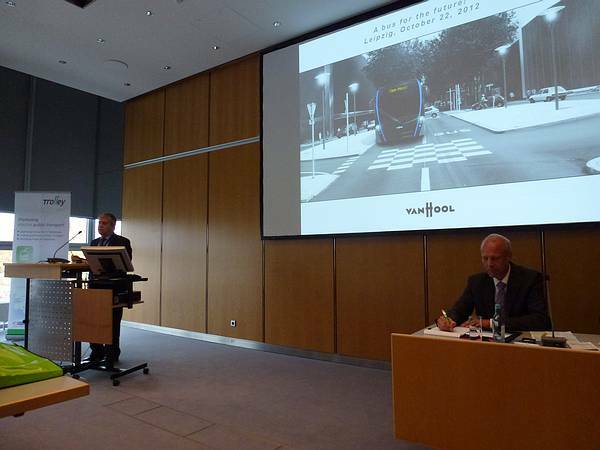 Paul Jenné, Van Hool (on the left), and moderator Arnulf Schuchmann, trolley:motion.